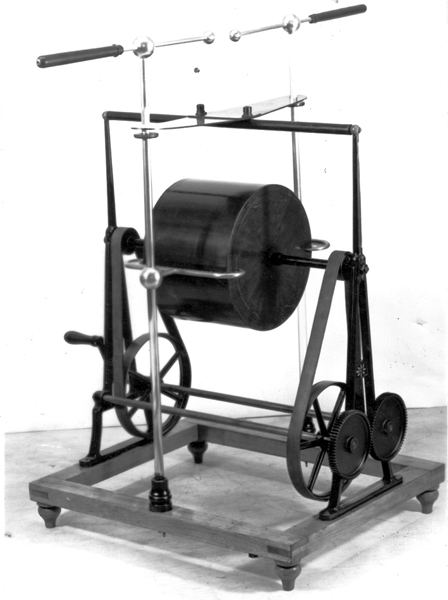 The curious electrostatic machine patented by Hermann Gläser  in 1889 was popularized by Rudolf Lewandowski and others in several articles -, and was cited as "Lewandowski machine" in some texts -. The machine attracted the attention of several researchers working with electrotherapy by the end of the XIX century, as being compact and insensitive to humidity. The machine was composed of two hollow ebonite cylinders T-T1 assembled so they turn in opposite directions one inside the other at small distance. Mounted fixed in the central axle e-f was a pair of metal combs forming a neutralizer circuit in vertical orientation (see below). At the horizontal diameter of the cylinders, outside, two charge collectors with metal combs Sk-Sk1 were positioned, connected to the machine's terminals m-n. 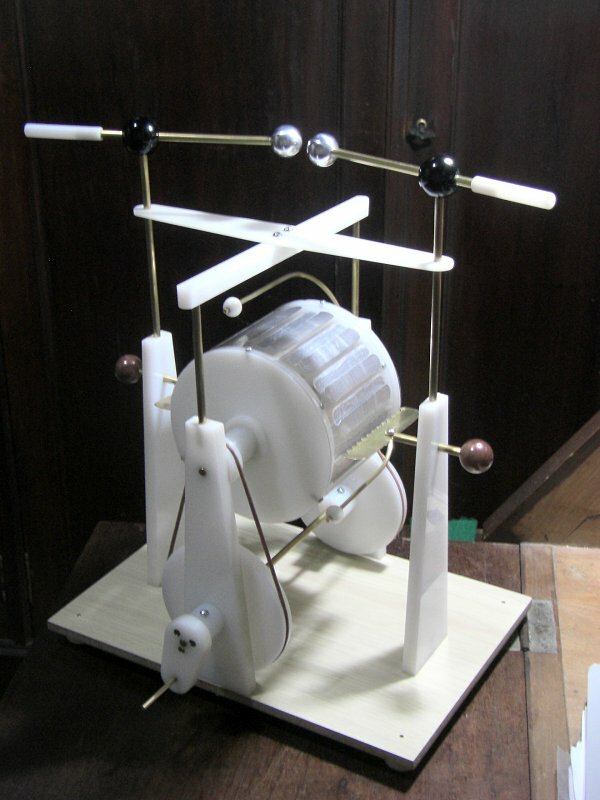 The driving mechanism used a pair of large pulleys H-H1 turning in opposite directions, driving small pulleys r-r1 by belts, connected to the outer and inner cylinders by ebonite tubes. Two gears b-b1 were used to invert the directions of rotation of the two lower axles W-W1, one of them driven by a crank k. A cross structure a-b-c-d above the cylinders was used to keep the assembly of the charge collectors and terminals firm. The machine apparently works as a cylindric sectorless Wimshurst machine without the usual terminals, with the output taken at one of the neutralizer circuits, interrupted by the spark gap. It requires excitation to start, usually a charged ebonite rod electrized by friction, brought close to the cylinders above or below them while the machine turns. A photo of an original machine of this kind can be found in the collection here. Several papers and books (see some references below) show engravings similar to the ones shown here . 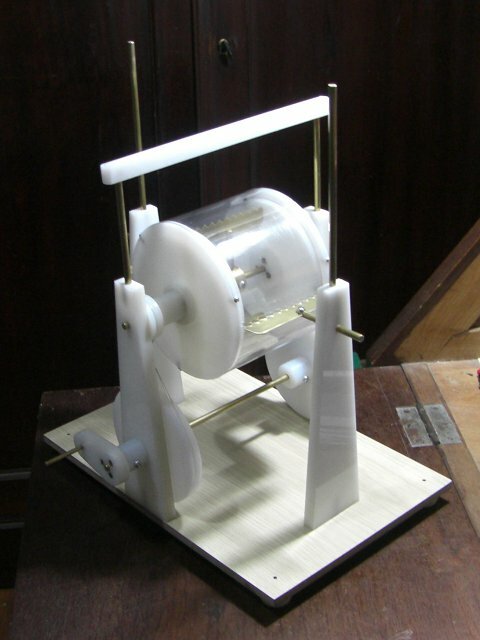 By November 2011 I started to build a small version of this machine to see how it works and maybe later build a greater version. For the cylinders my initial idea was to use sections of PET bottles of different diameters, in an attempt to find an use for that material, that is highly insulating and easily available, although not resistant to heat. For the lateral disks I used HDPE cutting boards, turned on the lathe for a tight fit inside the cylinders, and fixed to them with three screws each. 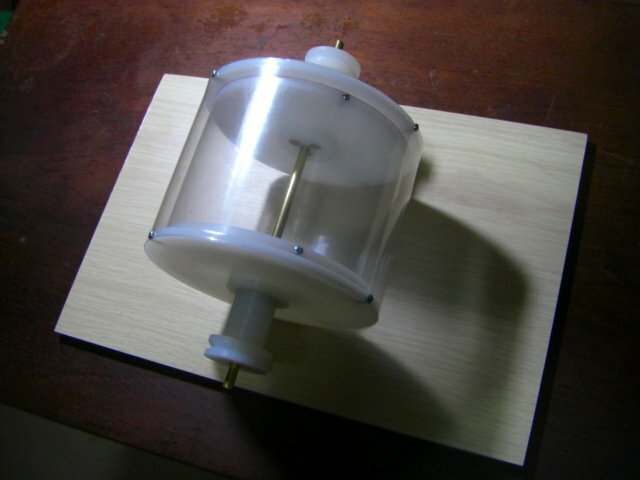 The small pulleys and tubes were made of nylon and were fixed to the lateral plates by screws. 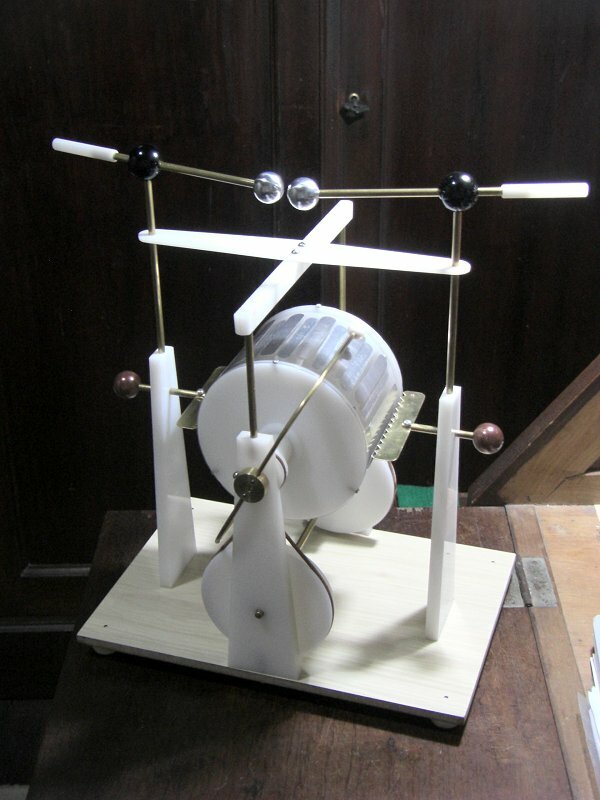 The structure was planned with HDPE plates and brass rods for most parts, following the original idea but with a simpler driving mechanism, similar to the one of a classical Wimshurst machine, with direct and crossed cords in two sets of pulleys to make the two cylinders rotate in opposite directions over the fixed central axle. PET cylinders (left) and plans for the complete machine (right). The machine used in electrotherapy . The machine could be tested before the construction of the terminals. Excitation was provided by connection through the terminals with another machine. Initially it only worked, alternating polarity periodically, while the other machine was working. This behavior could indicate that the charge multiplying mechanism had insufficient gain due to the distance between the cylinders. The internal cylinder was then rebuilt with larger diameter, by using a PET strip with an overlapped joint instead of a continuous cylinder, cut from another bottle as the one used for the external cylinder. The distance between the cylinders was decreased from 7 mm to 2.5 mm. I suspected that this would not be a problem, and apparently really wasn´t. The machine then worked, also alternating polarity but continuing after the exciting machine had stopped. It worked better with Leyden jars connected to the terminals. A better excitation method was to place two electrodes, one above and other below the cylinders, at small distance, connected to the exciting machine. The machine then could work with the terminals short circuited, and could keep excitation for indefinite time after the disconnection of the exciting machine without polarity reversal and would retain charge and restart if stopped for some time. But with the terminals open it would stop immediately. This is the expected behavior for a sectorless Wimshurst machine with only the neutralizers mounted. The operation reported in the old articles was then not observed in this machine. Maybe due to different materials used or the small size, but the structure of the machine really doesn't look reliable. With the terminals short-circuited, current could be drawn from the two quadrants of the cylinders where polarities are identical, without stopping the operation. 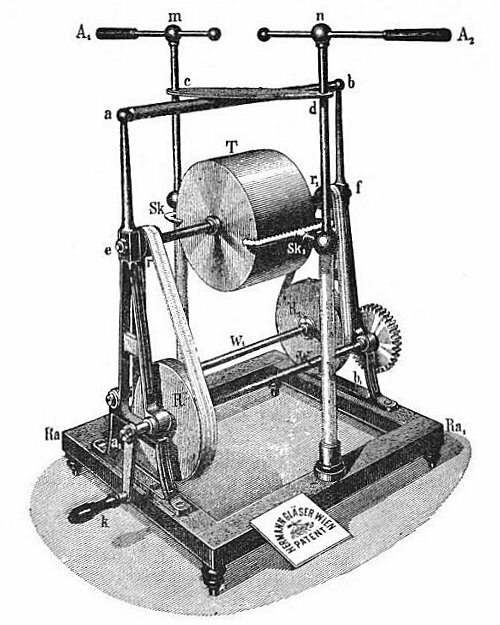 This indicated that the machine could be made to work with the addition of an external neutralizer circuit, providing a short-circuit over the surface of the external cylinder after it passes under the output charge collectors, essentially converting it to a cylindric sectorless Wimshurst machine with the output at the outer cylinder only. 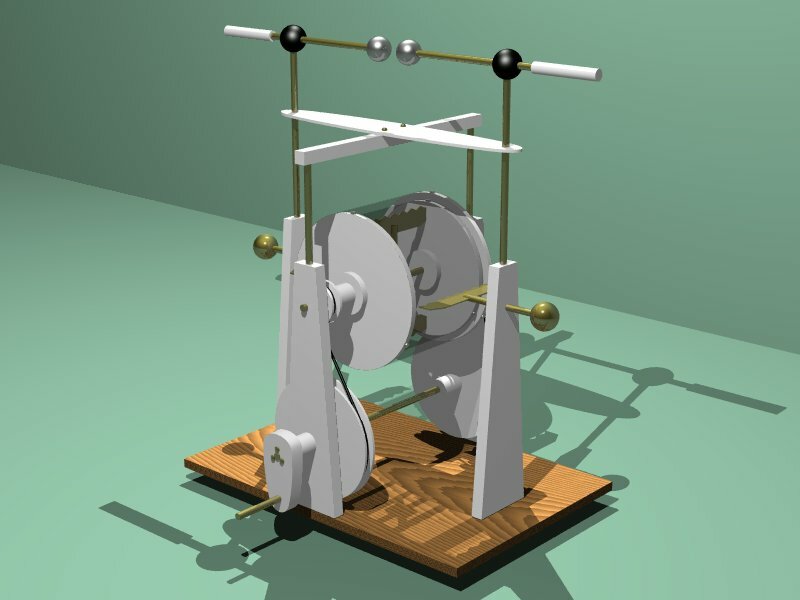 To avoid the need of external excitation, at the expense of smaller output power, sectors and brushes could be added, forming a sectored Wimshurst machine. Something to be observed is that the original descriptions require the cylinders to be air-tight, while articles about other cylindric machines stress the need of removing air full of ozone and nitrogen oxide from the interior of the cylinders. This question will be answered by observing how the machine behaves after some time. Concluding that the original idea was not reliable, I added 16 sectors to each cylinder and an external neutralizer, with brushes of thin ni-cr wires at the internal and external neutralizers, and completed the terminal assembly. The resulting machine works reasonably well, but is not powerful. It starts up immediately, is insensitive to humidity, produces sparks with up to 1.5 cm between the 1.8 cm terminal balls (~27 kV), and generates about 3 µA of current between one terminal and the neutralizers with the crank turned at 3 turns/second. The clearances would allow about 6 cm of spark length, but something impedes enough rise of the output voltage, probably the brushes at the neutralizers, that would be far from the terminals in a conventional plate machine, but are quite close in this compact cylindric version. The charge collectors made from serrated brass foil, are also not good at retaining charge, due to corona at the edges, and really corona can be seen at the external edges in the dark. The PET may have some characteristic causing this too. With so low current output any loss impedes the voltage to rise. I tried to reinstall the original inner cylinder, with sectors, to see if the joint in the substituted cylinder was causing some problem. The machine works with it, but is even more weak. Some investigations will still be done with the structure, trying to find the losses that are impeding further voltage rise. An interesting property of the machine is the relatively good insulation of the neutralizer assembly, which is floating, what allows the machine to operate with one terminal grounded, with the voltage at the other terminal doubled and the neutralizers at half the voltage. The video below shows this. When I touch one of the terminals the voltage at the other rises, and voltage of the same polarity and about half the value appears at the neutralizers. 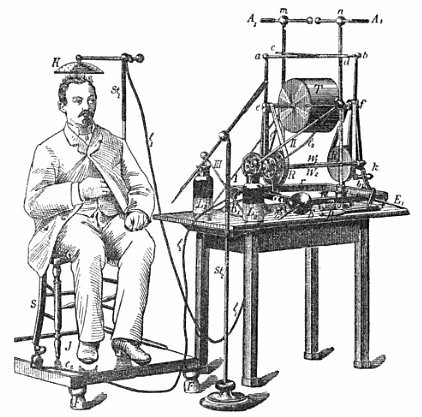 H. Gläser, "Static induction machine," U. S. patent no. 401156, April 9, 1889. R. Lewandowski, "Ueber eine neuartige Influenz-Elektrisirmaschine," Wiener Medizinische Presse, Nr. 23, col. 833-836, 1888. K. "Die Gläser'sche Influenz-Elektrisirmaschine," Elektrotechnische Zeitschrift, pp. 452-453, October 1888. R. Bielschowsky, "Ueber Influenz-Elektricität und die neue Influenzmaschine von Gläser in Wien," Therapeutische Monatshefte, Volume 3, pp. 107-112, 1889. Henry McClure, "An international system of electro-therapeutics," Horatio R. Bigelow, Rebman, London, 1894. William Edward Steavenson, Henry Lewis Jones, "Medical Electricity," P. Blakiston, Son & Co., Philadelphia, 1892. Thomas Stretch Dowse, Lectures on massage & electricity in the treatment of disease (masso-electrotherapeutics), Treat, 1890.